So, you started a business and it was successful. Awesome! Then, you decided to expand to the internet to increase your foot traffic, sales, or company recognition. Great! Now that your business is represented online, the breadth of possibilities is practically endless. A solid online presence is a great way to display the important aspects of your business and to increase the effectiveness of a marketing strategy. 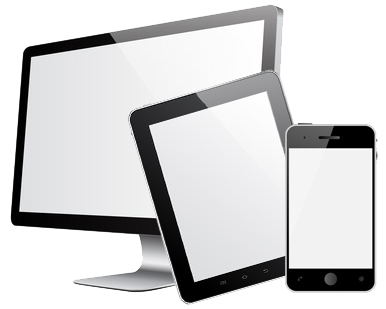 We are in a mobile, digital age, so in order to meet the needs of your clientele, having a website that works on all any device, regardless of screen size is a necessity. Developing a responsive website design is the way to achieve this. Responsive Website design is an approach whereby a designer creates a Web page that “responds to” or re-sizes itself depending on the type of device it is being seen through. That could be an over-sized desktop computer monitor, a laptop, a 10-inch tablet, a 7-inch tablet, or a 4-inch smartphone screen. Responsive Website design has become one of the hottest trends in 2013. This is due in part to the growth of smartphones and other mobile devices. More people are using smaller-screen devices to view Web pages. How Will Having A Responsive Website Help My Business? Your website is the first thing a lot of your customers will see before even contacting you, assuming you have one. You, or your company, spent a lot of time and money designing and developing a website that encompassed the values of the business, presented information cleanly, is easily navigated, and highlighted the most important features of your company. You want those factors to be evident online no matter how your clients choose to access your website. You want the website that appears on a computer to look just as good on a tablet or smart phone. It needs to be easy to use and provide all the information that is important on the go. Culturally, we don’t stop for anything anymore, and a responsive website allows customers to connect directly with your business without having to be in front of a computer. From a marketing perspective, a responsive website design can enhance the effectiveness of your marketing campaign by allowing potential customers to instantly connect with you. There is no delay or attempting to remember to “check that site out when we get home”. Your customers can see your add and immediately look at your website. Modern marketing often utilizes mobile devices to make advertisements more effective, so a responsive website design broadens your marketing options. If you aren’t using a responsive design, you’re running the risk of your site not displaying properly. Menus, alignments, or images could be skewed or proportioned incorrectly, your client may have to scroll around to find content, or it may be so muddled it’s illegible. By implementing a responsive design, you know everything will be laid out clearly and the most important information can be featured conspicuously. A responsive layout for your website will also assist in maintaining brand recognition. By making your website responsive you will be able to ensure that your website looks the same whenever or wherever it is accessed. This is especially effective if you choose to have an adaptive layout as that will give you more control over the specific placement of banners, images, and text. As technology advances, more options become available for handheld devices. For example, the iPhone alone has gone through four different screen sizes and six different screen resolutions since its initial release. Having a responsive website not only allows your customers to see your site at its best as a representation of your business, but it also means there is less of a need to continually redevelop new layouts to keep up with the ever changing technology of mobile devices. How Do I Make My Website Responsive? Making your website responsive really depends on how your website is being, or was initially built. For example, if you are using a content management system like WordPress, Joomla, or Drupal, you will be able to find a wide variety of themes that are already designed to be responsive. If you are going down this path, be sure to check any custom CSS that may dictate the layout of your website before making it responsive. If your theme isn’t already responsive, you can make it so in systems like wordpress through custom coding or modules like Bootstrap. If your website was custom built, you will want to contact your developer to see what options they have available to make your website responsive. If you haven’t built your ebsite yet, but know you are going to be working with a developer, be sure to ask if they include responsive designs in their services. Responsive website layouts open a world of possibilities to your website and your business. Not only does it allow you to ensure the online representation of your business is as neat and tidy as you, but it will allow you to connect with more and possibly new demographics of customers. ← Guest blogging is no longer important for search engine optimization (SEO). Hello everyone, it’s my first go to see at this site, and piece of writing is actually fruitful for me, keep up posting these types of articles. Pretty nice post. I simply came across your weblog and wished to say that I’ve really enjoyed browsing your website posts. every one be effective at simply know it, Thanks a whole lot. I just want to tell you that I am beginner to blogging and really liked you’re web site. Probably I’m planning to bookmark your blog . You surely come with excellent article content. Cheers for revealing your web page.